HILLSDALE – No matter the importance of the game there are going to be times where the ball simply will not go through the hoop no matter what play is drawn up. That is the frustration that the Paramus Catholic players felt against upset-minded Westwood in the Bergen County quarterfinals on Saturday. Running out of options after trying everything to get their offense going, the Paladins relied on the one thing that was working all game long to earn them their biggest win of the season. The Paladins had 14 steals with half of them coming from sophomore guard Janel Moore. Two of those steals led to baskets during a 12-2 run to open the fourth quarter as fourth-seeded Paramus Catholic grabbed a berth in the Bergen County semifinals with a 39-27 victory over 12th seeded Westwood at Pascack Valley High School. 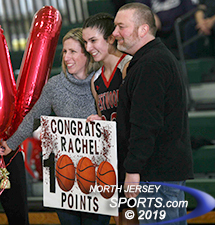 After several minutes of anticipation, Westwood senior forward Rachel Bussanich knocked down two free-throws with 2:10 left in the first quarter to reach 1,000 points for her career. “That’s a great accomplishment for a great player on and off the court,” said Westwood head coach Charlie Collis. While it was an offensive achievement that was given a well-deserved ovation it was the defense of both teams that dominated the first half. Both teams shot under 20-percent for the half with a steal and layup by Moore at the halftime buzzer giving the Paladins a 19-11 lead. Westwood’s Rachel Bussanich made two free throws to reach the 1,000-point mark. The lead grew to 11 with just over two minutes left in the third quarter. The feeling in the gymnasium was that PC was about to put the game away, but the Cardinals had other ideas. Meghan Riedel had a steal and breakaway layup followed by a three-pointer from the top of the key by Sam Moleti to cut the Cardinals’ deficit to 27-23 at the end of the third quarter. With the game hanging in the balance, Moore took over on both ends of the floor. She hit Julianna Kascic for a baseline jumper to spark the run then had a steal that led to an acrobatic three-point play to close out the 12-2 run to put the game away. Moore filled the stat sheet with 11 points, seven steals, five assists, and four rebounds for Paramus Catholic (14-2). Aria Meyers had a game-high 14 points and six rebounds. Bussanich and Riedel each led the way for Westwood (13-5) with nine points apiece. Paramus Catholic gets the ultimate test this week when facing the two best teams in North Jersey. After a matchup with rival IHA on Thursday they get a shot at the three-time defending Bergen County champ and top seed Saddle River Day in the Final 4 on Sunday at Ramapo College.